Here are some examples of Chip, just a few days ago: at 14.5 months, he finally started walking, and you can see the awe-inspiring footage here. 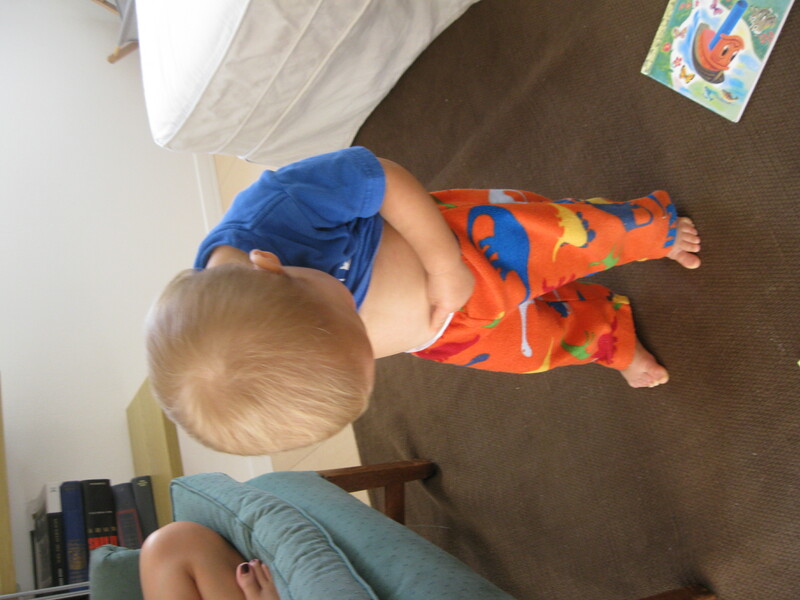 Here he demonstrates another new trick: showing his bellybutton while standing confidently. To celebrate Chip’s 15-month birthday yesterday we went to this place in Yokohama aptly named the “Anpanman Children’s Museum and Mall.” Anpanman is this uniquely Japanese animated creation whom Chip loves. I think it’s the face. Chip and Anpanman, in happier times. Anpanman is a superhero whose head is made of bread. One of his good deeds is to fly around the world and feed starving people by giving them bits of his head to eat. His nemesis is a germ (so Japanese) named Baikinman, or “Meanyman.” Whenever Chip sees Anpanman (and he is ubiquitous in Japan) he points and yells “Da-da!” (Still his catch-all word). 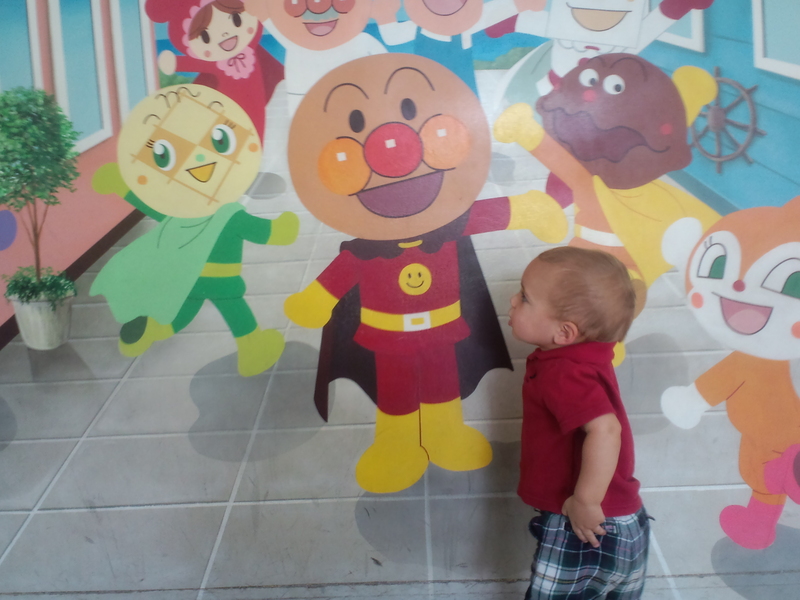 So, I thought it might be fun to take the newly-minted toddler to the Anpanman Museum/Mall. And fun it was, until still-wobbly Chip went down hard in the kid-sized sushi shop in the Anpanman Village. Five hours of intermittent wailing later, I noticed that he refused to put any weight on his left foot. 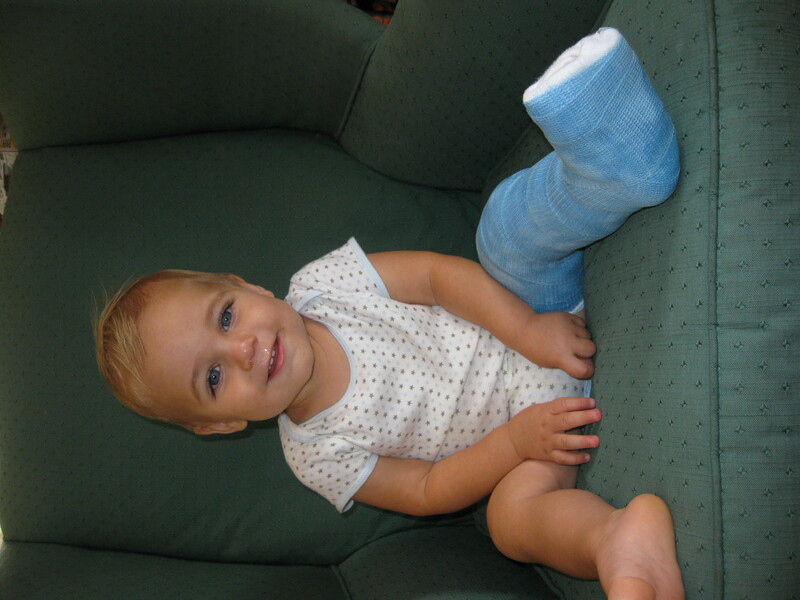 I took him into the base ER yesterday evening, and we left well past his bedtime with the awesome thigh-to-toe blue cast. Someone else has already pointed out that the cast is suspiciously close to Carolina blue, so don’t even bother. The only alternative was a K-State shade of purple. Poor Chip! He was so fond of his new mobility and independence. Poor Mama, having to haul a 24-lb. 15-month-old with a 5-lb. cast around for another month or so. And poor Da-da (the real version, not the Anpanman version) who is missing all of the fun. Fortunately the doctor said that babies heal very quickly, and he should have his cast off in about four weeks with no lasting effects I, however, shall harbor a lingering resentment toward bread-headed superheros. Poor kiddo… although he doesn’t look too upset about it in the above picture! That cast looks Warhawk blue to me! Poor Chip! Maybe it was his destiny to crawl a little longer… i know i could run faster and jump higher after i ditched my first cast, he’s bound to do the same. Good luck keeping up after a few weeks! A cast is a difficult accessory to work with, yet, as usual, Chip pulls off the look flawlessly. Perhaps it is the cast/onesie coordination? Or, does the color of the cast bring out his blue eyes? Clearly, he employs a top-notch stylist. Yikes! A bread-headed super hero! Glad Chip is ok. Of course he looks great! Keep up the good work, Mom. How sad a cast…seems to me, you’ve got a pretty good lawsuit on your hands, I mean that bread head, could soon be called something like the WattsKlinenator…just sayin! Hope you are well. Chip sure looks cute, love those baby blues on him. Sorry to see Rob have to miss all the excitement. It always seems to work out that way. Can’t wait to see more walking posts once the cast is off. You are doing a great job with him and you are sooo adventuresome. Hang in there!